Redesigned for 2018, Subaru Crosstrek is the second generation of the diminutive crossover five-passenger hatch. With its superb all-wheel-drive system, a raised suspension, and Subaru’s rally experience, the Crosstrek is a good car for gravel roads, primitive two-tracks and nasty weather. At a glance, the reworked Crosstrek doesn’t look much different, however. And our first impression is of an old-fashioned car, with a traditional key, traditional handbrake lever, and a traditional clutch pedal to go with a traditional manual gearbox. The suspension feels soft, with lots of travel. It leans in corners, the nose dives under braking, the rear squats under acceleration. We like it and would choose it for wicked conditions or unpaved roads. Subaru’s direct-injected 2.0-liter, horizontally opposed four-cylinder engine has gained 4 horsepower, now rated at 152. The flat-4 layout of the engine results in a lower center of gravity and a lower hoodline than is possible with a conventional, upright inline-4. In addition to a solid foundation, the Crosstrek may be equipped with Subaru’s EyeSight suite of advanced safety features. Optional for Premium and Limited trim levels with the CVT, the EyeSight group uses a forward-facing camera and includes forward collision warning with automatic emergency braking, active lane control, adaptive cruise control, and individual tire-pressure monitoring. Limited models include blind-spot monitoring with rear cross-traffic alert. Newly-available steering-responsive headlights can illuminate curves ahead. Crash-testing of the 2018 Crosstrek by IIHS resulted in Good ratings for driver’s small overlap, moderate overlap, and side-impact testing. Crosstrek Premium offers manual ($22,595) or CVT ($23,595) and adds heated front seats and mirrors, sound-insulated front windows and windshield, automatic headlights, and leather-wrapped steering wheel. More options are available, including the EyeSight safety suite and a moonroof. Crosstrek Limited ($26,295) comes only with CVT and includes leather upholstery, Harman Kardon premium audio, pushbutton start, automatic climate control, power driver’s seat, an 8-inch display, steering-responsive LED headlights, and 18-inch wheels. Although the rugged stance and profile of the Crosstrek haven’t changed much, its beltline is slightly higher. More black cladding covers the prominent wheel arches, as well as rocker panels and roof rails. Most revisions are noticeable up front, with more hawklike headlights reaching into the fenders. Below Subaru’s signature hexagonal grille, the lower bumper contains more black plastic. Front pillars reach farther forward than before, improving visibility. Subaru has integrated taillight assemblies into the hatch, widening the separation by some four inches. A concealed exhaust outlet accurately implies that Crosstreks don’t focus on performance. Quiet and ergonomically improved, compared to its predecessor, the 2018 Crosstrek cabin ranks average for the small-crossover class. The interior cannot be called stylish or stimulating or upscale. It’s functional. Horizontally laid-out, the dashboard reaches down toward the central console. Notable touches include contrast stitching and aluminum accents, offsetting the relatively dark interior. Comfort isn’t really the Crosstrek’s principal mission, either, but in conjunction with greater refinement, it’s improved dramatically in the second generation. Front seats promise comfort for occupants of various body types. Rear passengers can expect an extra inch of legroom, compared to the prior Crosstrek. Expanding body width by nearly an inch should help ease shoulder space, too. Cargo capacity has grown to 55.3 cubic feet with the seats folded down (an increase of 3.4 cubic feet). With the rear seatbacks upright, it has shrunk slightly, to 20.8 cubic feet. Despite its new form, the Crosstrek’s overall purpose hasn’t changed a bit. Subaru carries on with its familiar flat-four engine, capable transmissions, and proficient standard all-wheel drive system, all tucked into a five-door hatchback body. Performance is sluggish. Acceleration from 0 to 60 mph takes something like 11 seconds, putting Crosstrek near the bottom of any performance chart. The engine feels low on energy. Highway passing can be a challenge, requiring patience and pre-planning, likely more so at higher altitudes. Throttle response is relatively quick, suggesting strong takeoffs, but actual acceleration is not. Picking a manual transmission over the CVT doesn’t make an appreciable difference. Constant shifting of the 6-speed manual is needed, to keep the Crosstrek moving adequately. Clutch-pedal travel is long and shifting manually is not sporty in this car. The CVT seems better at extracting the most from the 2.0-liter engine. Premium and Limited CVTs incorporate a 7-ratio manual mode, with simulated gears selected by paddle shifters. All-wheel drive helps make the Crosstrek impressively sure-footed, augmented when cornering by the brake-based torque-vectoring system. Ground clearance of 8.7 inches makes the Crosstrek’s off-road prowess possible, as does hill-descent control with the CVT. Ride quality has improved dramatically over the first-generation Crosstrek, helped by softer springs and damping. There is head-toss in corners, however. Steering is quicker than it used to be. A dead spot in the center of the steering-wheel range likely helps highway stability, but some drivers might be annoyed by the need to make numerous minor corrections to stay on course. Crosstrek is moderately fuel-efficient, notable given its all-wheel drive. 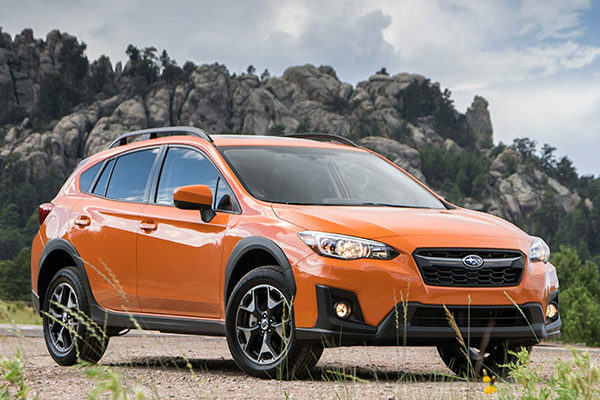 With CVT, the Crosstrek is EPA-rated at 27/33 mpg City/Highway, or 29 mpg Combined. Manual shift drops the estimate to only 23/29 mpg City/Highway, or 25 mpg Combined. Subaru has moved well ahead in available technology and passenger comfort, to rival the class-leaders. The base Crosstrek may offer the best value, but even a fully equipped model is priced sensibly. Not everyone needs the higher ground clearance, go-anywhere capability, but the rugged-look Crosstrek comes across as a step above ordinary small crossovers. This is a basic car for buyers who are looking for utility and value in a vehicle that can handle rugged roads. James M. Flammang contributed to this report; New Car Test Drive editor Mitch McCullough reported from New Jersey, with staff reports.